MILLENNIUM CROSS - is a 66-metres (217 ft) high cross situated on the top of the Vodno Mountain. It was constructed to serve as a memorial of 2,000 years of Christianity in Macedonia and the world. ST. PANTELEJMON CHURCH - located in Gorno Nerezi Vilage is a small 12th century Byzantine church located in a monastery complex. The coloring, dramatic composition and purity of expression displayed in the frescoes are outstanding examples of Macedonian medieval monumental painting in the later 12th century. 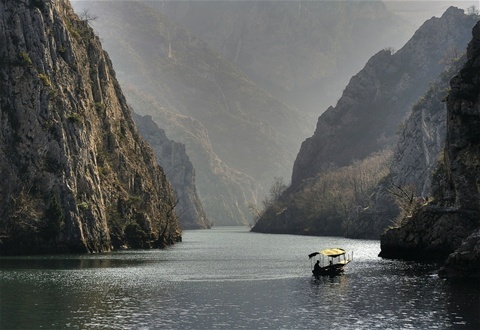 CANYON MATKA - Matka is one of the most popular outdoor destinations for the local people in Skopje. Canyon is located around 15km on the west from the city, covering roughly 5,000 hectares. It is a home of more than 70 spicies of small butterflies and several medieval monasteries. The Matka Lake within the Matka Canyon is the oldest artificial lake in the country. Over there you can enjoy several outdoor activities like hiking, kayaking etc. Don't miss the oportunity to take the boat trip and visit one of the 10 caves inside the cayon.